Darshan Gooch is tall, lanky and soft spoken. If Mr. Buzz is Nathan Fletcher’s vessel for rocketing into the stratosphere and G-buzz is the everyman’s small wave performance grovel board, then where does that put the Super Buzz??? Remember when President Teddy Roosevet said, “Speak softly and carry a big stick” all those years ago? Well, here’s the soft spoken Señor Gooch letting his surfing do all the talking while his little 5’8″ does the rest. SuperBuzz SK8 with Darshan Gooch from Stretch Boards on Vimeo. Have you ever discounted the thought of a Super Buzz (sk8 or no sk8 deck) as an everyday board for mediocre to ripping waves? Have you ever been torn between sizing up a Mr. Buzz to handle more daily driver duties or perhaps altering dims on a G-Buzz because the waves you frequently ride are skewed a little bit over from what “those guys” are riding? We get ya. We’re human and we’re also surfers and yeah, we’ve thought about all that stuff too. We put a lot of thought into how our boards ride from the model itself, the fins you put in and the specific construction being used. We have foresight and we’ve taken action. The Super Buzz is the “inbetweener“, the “everyman’s board” and the “stokemonger” you have been looking for. 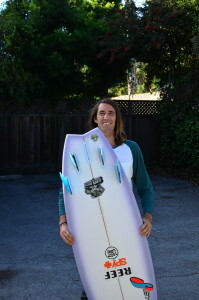 You may not be a tall, lanky freesurfer like Gooch but i bet you could benefit from a utilitarian, durable and performance shredder that spreads the scope of your rideable wave spectrum and blurs the lines of what a daily driver can be and what it can (or perhaps should) do to keep putting a smile on your face.